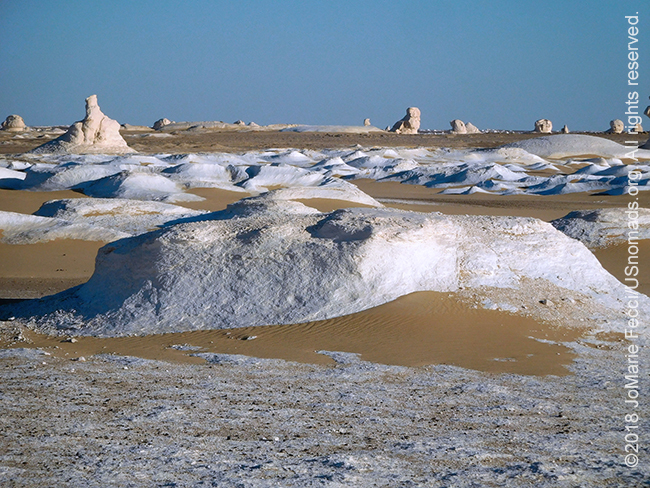 WESTERN DESERT, EGYPT (1 April 2018) — It looked like snow in the Sahara. Ice bergs melting in the desert. The White Desert is truly an other-worldly place, with a visual profile alternating between the artic poles and another planet. 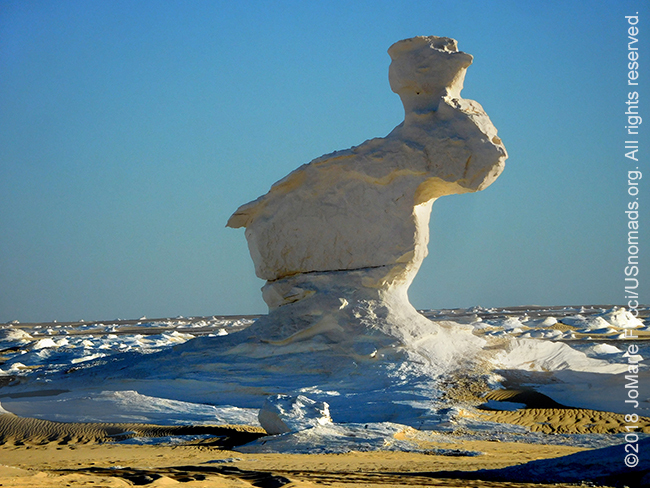 White rock formations rise up from the sand like surreal spires in a dada-esque church and hills of white sandstone seem snow covered from a distance. We drove into this place from the Agabat Valley, across the point where the white and black sands meet, stopping at the well of Ain Khidra, where there was shade for the hottest part of the afternoon. Nestled under a thick bunch of palm, we were almost invisible in the shadows and it made me think of how many places there are in the desert where you can disappear in plain sight. Even though on first glance you would think there is no place to “hide” in these vast wide open spaces, there are cracks in the rock walls, spots protected between the base of dunes and the sheer cliff faces, and thick desert brush or islands of palm, like Ain Khidra. Beyond lay more desert that began to turn into a bizarre sculpture garden just on the other side of El Santa, a very old acacia tree that sits alone on a hill. When we arrived to the place of the tree, the desert still looked “normal,” and Abdou suggested I climb up to El Santa for an “overview.” I took his advice, and as I walked to the edge of the hill, I gasped out loud at the strange world on the other side. I felt like I had gone “thru the looking glass” à la Alice-in-Wonderland and came through on another planet. A sea of giant round boulders led to a series of low white hills, and in the distance what looked like ice bergs — it didn’t look real. But it was. I wandered down around the boulders for a bit, before continuing on the trail towards the distant “ice bergs.” The low white hills were like petrified sand dunes, and beyond those a series of crazy white rock formations reached towards the sky. 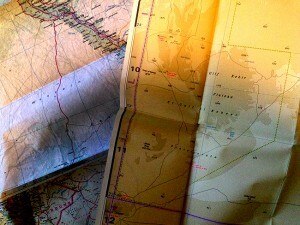 JoMarie Fecci, of USnomads, sets off on an independent scouting trip across Egypt and Sudan in preparation for an up-coming Sahara expedition. Driving locally-sourced Toyotas and working with small local teams in each region, she will traverse a winding route that jumps off from key points along the Nile as far south as Khartoum, where the Blue and White Niles meet. During the journey she will visit a series of UNESCO world heritage sites focused on the ancient civilizations that occupied the region and meet with local communities. The primary goal of this mission is to assess terrain, security, driving conditions, logistical concerns and approximate timeframes for future travel. The Arab Republic of Egypt, is a transcontinental country spanning the northeast corner of Africa and southwest corner of Asia by a land bridge formed by the Sinai Peninsula. With the Mediterranean sea on its northern border, the Gulf of Aqaba to the east, and the Red Sea to the east and south, it occupies a geo-strategic location connecting Europe, Asia and Africa. It has land borders with Gaza and Israel to the east, Sudan to the south, and Libya to the west. Islam is the official religion and Arabic the official language. Egypt is the most populous country in North Africa and the Arab world, with over 95 million inhabitants. Most of the population lives near the banks of the Nile River, in an area of about 40,000 square kilometres (15,000 sq mi), where the only arable land is found. The large regions of the Sahara desert, which constitute most of the country’s territory, are sparsely inhabited. Considered a cradle of civilization, Egypt emerged as one of the world’s first nation states in the tenth millennium BC and iconic monuments such as the Giza Necropolis and its Great Sphinx, as well the ruins of Memphis, Thebes, Karnak, and the Valley of the Kings, reflect this legacy.